Lie supine (on your back) on a flat bench, spread your legs, and plant your feet flat on the floor for stability. Dismount the barbell using a shoulder-width grip. Exhale as you press the barbell back up to the starting position. Keep your elbows high and approximately 45 degrees out to your sides. 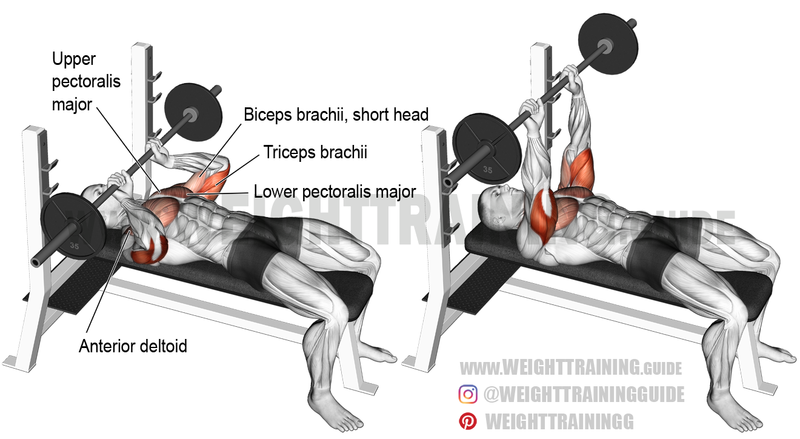 Keeping your elbows high will emphasize elbow extension over horizontal shoulder flexion and therefore emphasize the involvement of your triceps brachii while minimizing the involvement of your pectoralis major and anterior deltoid. This exercise requires practice. Start light and increase weight as you master proper form. After you master form, start to push the barbell upward more rapidly to develop greater triceps power. The barbell JM press is a cross between a barbell skull crusher and a barbell bench press. It was invented by powerlifter JohnMark ‘JM’ Blakely. The name of the exercise wasn’t actually coined by Blakely but Louie Simmons and George Halbert of Westside Barbell, who named the exercise after Blakely when he first started training there. A bench press specialist, Blakely competed in powerlifting in the early ‘90s. He holds six world records, is a four-time world bench press champion, and was the eleventh man in history to bench press 700 pounds. The barbell JM press was one of the only triceps exercises Blakely would use, and he credits it for building all of his triceps strength for bench pressing. See the video for Blakely’s barbell JM press demonstration. Also known as the barbell Blakely press. The inventor of the barbell JM press, Johnmark Blakely, explains how to perform the exercise.